Looking for exceptional event favors that can be personalized to make truly memorable mementos of your special occasion? Well, Fashioncraft's exclusive Glassware for All Occasions collection is the clear choice. 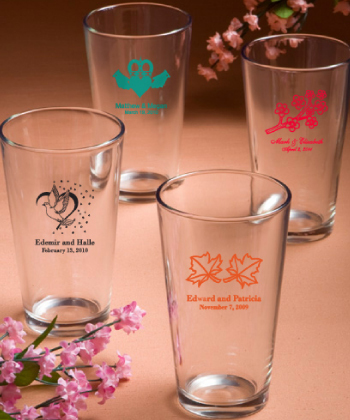 Offered in a cheerful array of personalized silkscreen designs including wedding, engagement, bridal and baby shower, christening, First Communion, confirmation, Sweet 16 and 15, birthday, retirement and more, our pint glass is pure class. Perfect for beer, mixed drinks and soft drinks, each is 16 ounce glass is 6" tall and 3.5" in diameter with the classic tapered pint glass shape and is made in the USA of quality domestic glass. Sold and packaged in bulk, Fashioncraft's Glassware for All Occasions pint glasses are sure to raise the bar as event favors with lasting appeal! Note: Minimum order is 24. Set up fee is $33. Click here and enter 33 for the set up fee.